Summer is out the window and autumn is knocking at my door! When I think of autumn I think of falling leaves, cooler weather, but mostly I think about autumnal food! 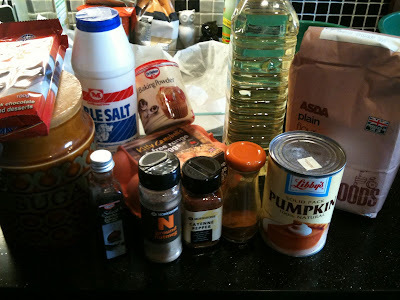 Squash, pumpkin, apple pie, soups, currys! Food that sticks to the bones and keeps you warm and cosy! I've had a few cans of Libby's Pumpkin Puree hidden in the cupboard for some time now. I don't know if it's just me, but I have a heck of a time finding it in the UK! The one shop I could find it in, is in a city I no longer live in, nooooooo. Peckhams (mainly based in Scotland) was the one and only place I could find cans of pumpkin puree, so suffice to say I use them sparingly. But since it's autumn and autumn calls for pumpkin it was time (also, I was set a challenge by a friend on facebook which finally spurred me on to open one of the cans). I've seen this recipe posted on quite a few pages on the interwebs, but it originates from Martha Stewart, the original domestic goddess! *Note: It helps to read through the recipe first so you don't end up using more bowls then necessary, I made that mistake. Luckily, I don't have to do the dishes! 1. Preheat oven to 350/180. Butter a 9-inch square baking pan or dish (i used rectangular one about 10x8). 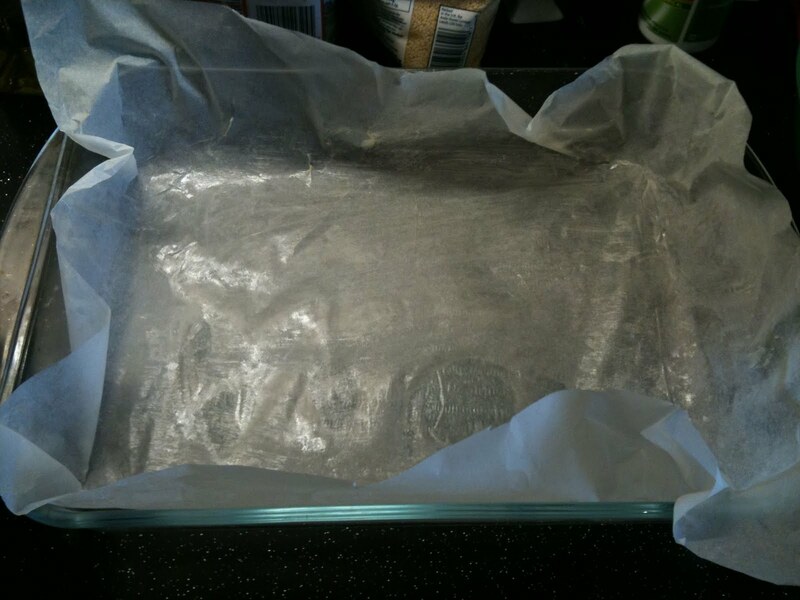 Cut a length of parchment that will cover the bottom and two sides, and line the pan with it. Butter the lining as well. 3. 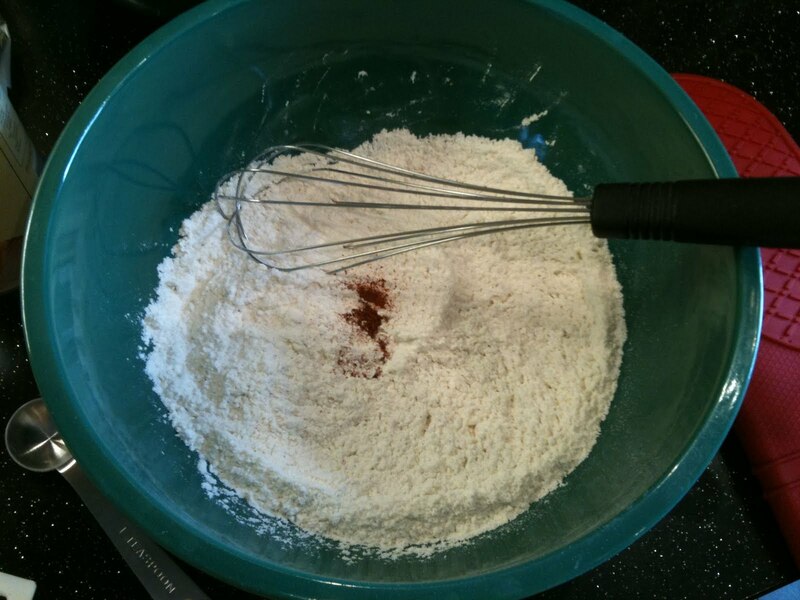 Whisk together flour, baking powder, cayenne, and salt in a large bowl; set aside. 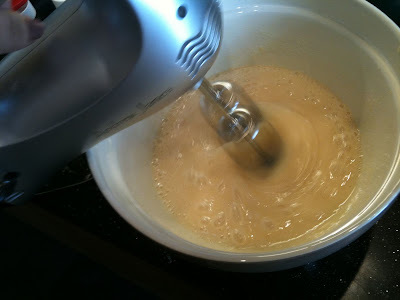 Put sugar, eggs, and vanilla in bowl and mix; beat until fluffy and well combined, 3 to 5 minutes. Then beat in flour mixture. 4. Pour half of batter into a separate bowl and stir the chocolate mixture into it. 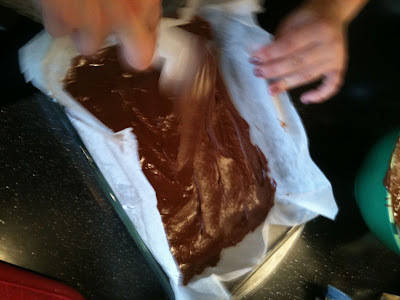 If you find that it is a little thick add a little more batter (a few tablespoons or so) until it is more pourable. 5. 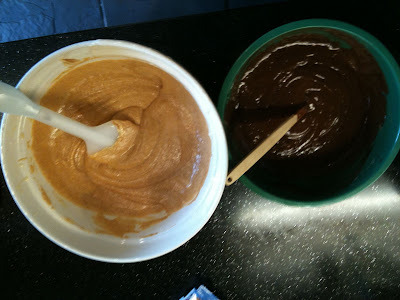 In other bowl, stir in the pumpkin, oil, cinnamon, and nutmeg (for some reason I mixed these together in a bowl first, before transferring to the other batter bowl, I don't know why). 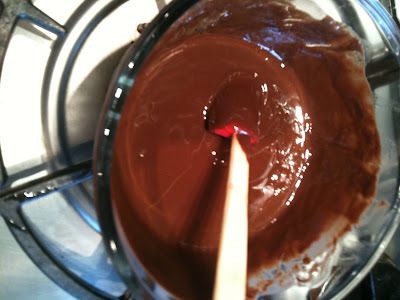 Transfer half of chocolate batter to prepared pan smoothing top with a rubber spatula. 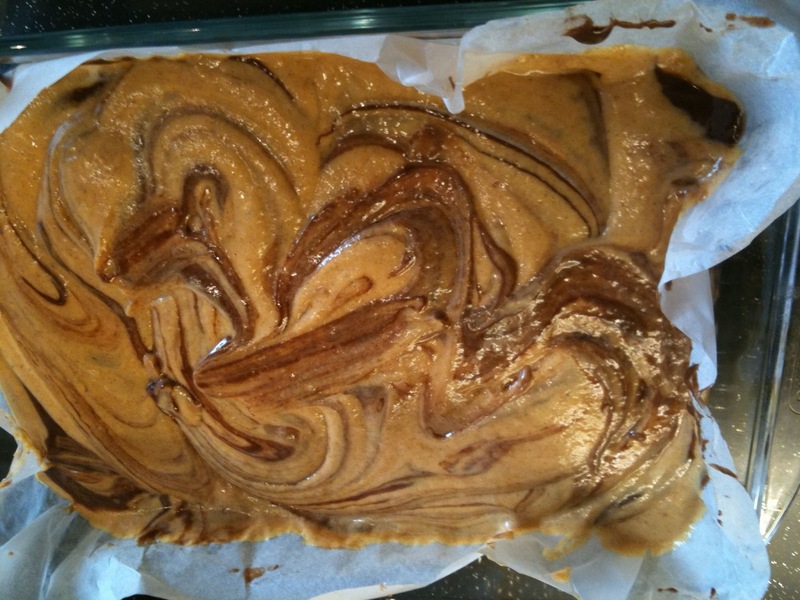 Top with half of pumpkin batter. Repeat to make one more chocolate layer and one more pumpkin layer. Work quickly so batters don’t set. 6. 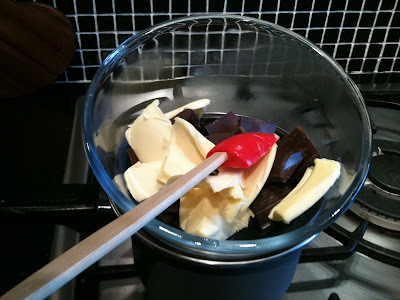 With a small spatula or a table knife, gently swirl the two batters to create a marbled effect. Be sure to get your knife all the way to the bottom of the pan–I didn’t, and ended up with a chocolate base, not that it is such a bad thing. Sprinkle with nuts, if using. 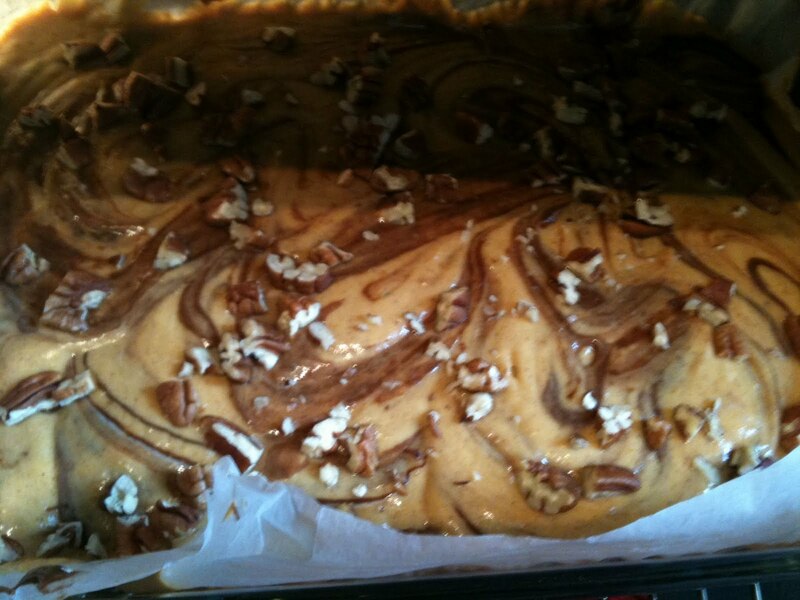 Pic of it in the oven with the chopped pecans on top. 7. 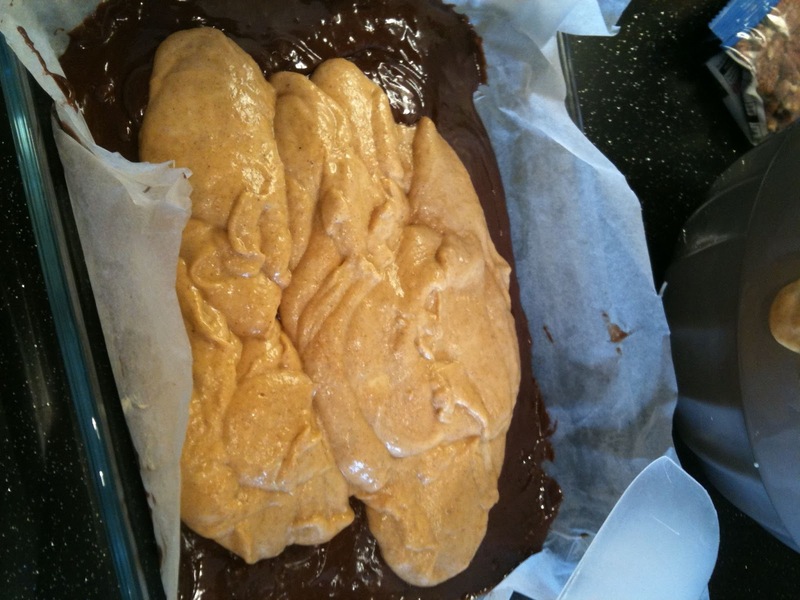 Bake for 40-45 mins (I did 40 with a fan assisted oven) until it's set. 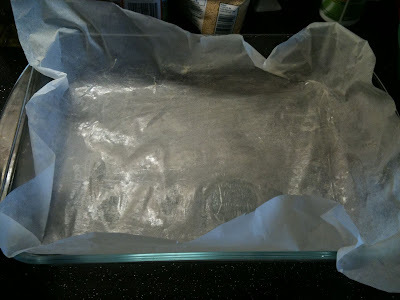 Let it cool in the pan for about 10 mins before transferring to a wire rack to cool further. 8. 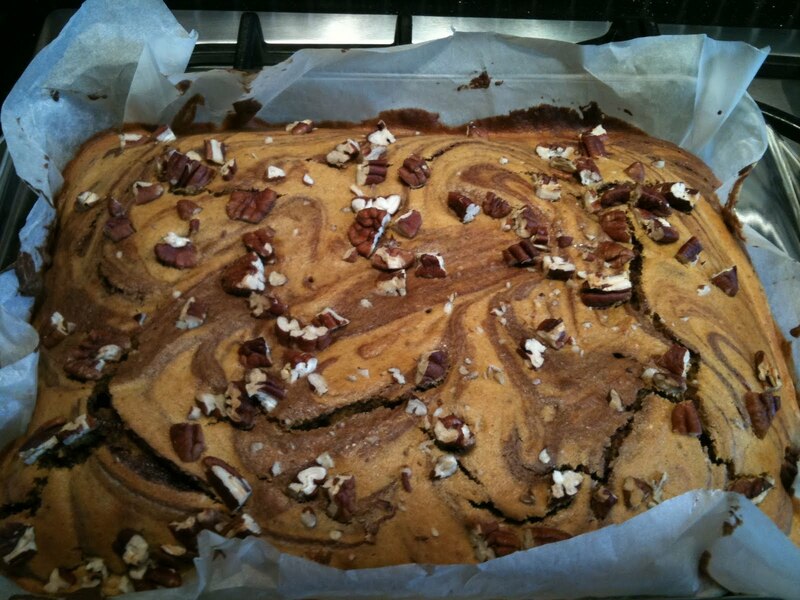 Cut it up and enjoy with a nice tea or coffee - I imagine a Chai Tea would be great with this, unless you think it's cinnamon overload (I never think you can have too much cinnamon!). Thank you so much for the lovely comment! I'm really glad that you enjoy my blog, I try to make it as easy and carefree as possible! 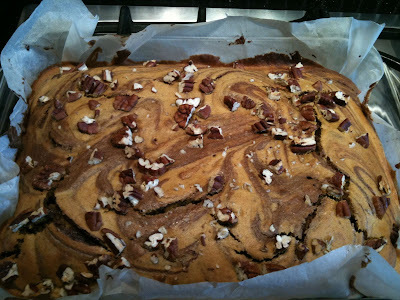 Come back anytime and if you try any of the recipes let me know how you got on!